Shelving can help you get more storage space in any room. Instead of taking up more floor space with cabinets, ottomans and other storage devices, you can take advantage of the vertical space that usually only holds pictures and other decor. 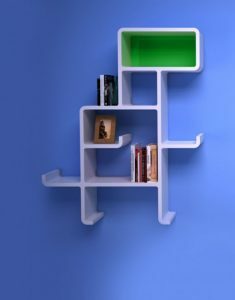 Modular wall shelves let you store books, DVDS and other media, and other items. You can even include fabric bins and small cabinets on your shelves for smaller items. Stair shelving is a unique storage option. 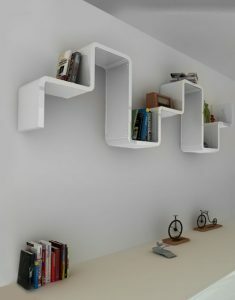 The shelves are connected in a staggered pattern that can look like stairs or steps. You can take advantage of the full length of the wall or just part of it. There are always small things to store in the kitchen, ranging from the dozens of bottles of spices we all have to the little specialty tools we need but can’t easily organize. You can create a small stair shelving unit over the stove or the sink, or you can create a tall, skinny unit next to the refrigerator or pantry. In addition to holding pantry items or cooking tools, these shelves can also hold cleaning supplies, mugs, and small decor. You can choose a theme for the shelf, or you can reserve it for the items that you use the most. Toy storage and organization is a constant challenge for parents. Kids find a way to wreck whatever system you put in place. With stair shelving, you can make it very easy for kids to access items and to put them away when they are done. They don’t have to organize toys into bins — they just have to place items on the shelves. You can make the shelving as short or as tall as you like. Taller shelves can hold items that you want to be kept out of reach, such as creams, medicines, or night lights. The shorter shelves can hold the books and toys that the kiddos are allowed to have. Most of us have dozens of bottles and jars of personal products crammed into our medicine cabinets or thrown in a big pile under the sink. We go looking for what we need, can’t find it, and then buy it again thinking that we need it. Yet all we do is add to the pile. Installing modular wall shelves in your bathroom will give you a place to store all those items and keep them organized. You’ll be able to see at a glance what you have and reach it whenever you need it. Put a unit by your shower, next to your toilet, or by your vanity. Instead of putting up boring bookcases and straight shelves, try out stair shelving in your living room for a unique look. You’ll have a nice place to put your books and other media, and you’ll create a talking piece at the same time. You don’t even need to hang the shelving unit for storage. You can use it simply to show off your favorite pictures, vases, and other decor. 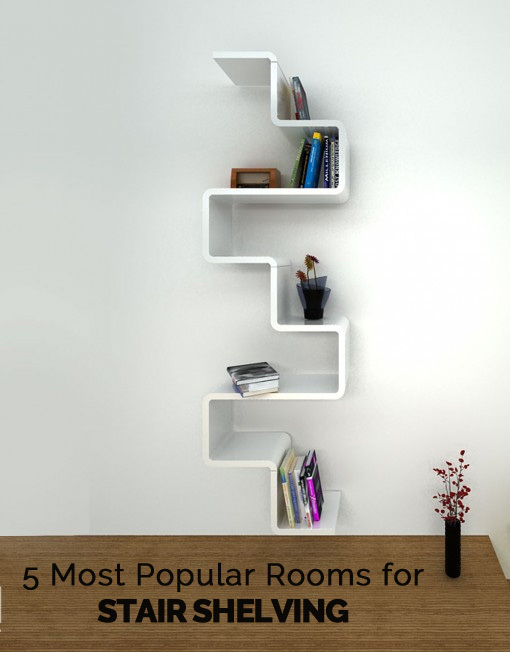 You can stick with the stair shelving design, or you can rearrange the modular wall shelves to create a unique shape that fits your decor. It’s surprising how many products we end up using for laundry. You never know when you’ll have a tough stain you need to get out or when you will be up against an especially stubborn wrinkle. Setting up stair shelving next to your washer and dryer will let you keep all those products close at hand while also staying organized. You can run the unit vertically between your machines, or you can run it horizontally above them. You can even create larger modular units that give you cubbies to place folded clothes when you are between loads. Expand Furniture sells a variety of modular wall shelves and stair shelving units that you can use in any room of your house. These modular units can snap together easily in different configurations, allowing you to create a shape that suits your tastes and the space, while also giving you the functionality you need. The shelves are made of high-quality materials and are built to last. Explore our online catalog to find the perfect shelving unit for your home.